We can learn a lot about improving the 21st-century world from an icon of the industrial era: the steam engine. Harnessing steam power required many innovations, as William Rosen chronicles in the book “The Most Powerful Idea in the World.” Among the most important were a new way to measure the energy output of engines and a micrometer dubbed the “Lord Chancellor” that could gauge tiny distances. Bill Gates at the World Economic Forum in Davos this week. In the past year, I have been struck by how important measurement is to improving the human condition. You can achieve incredible progress if you set a clear goal and find a measure that will drive progress toward that goal—in a feedback loop similar to the one Mr. Rosen describes. This may seem basic, but it is amazing how often it is not done and how hard it is to get right. Historically, foreign aid has been measured in terms of the total amount of money invested—and during the Cold War, by whether a country stayed on our side—but not by how well it performed in actually helping people. Closer to home, despite innovation in measuring teacher performance world-wide, more than 90% of educators in the U.S. still get zero feedback on how to improve. An innovation—whether it’s a new vaccine or an improved seed—can’t have an impact unless it reaches the people who will benefit from it. We need innovations in measurement to find new, effective ways to deliver those tools and services to the clinics, family farms and classrooms that need them. I’ve found many examples of how measurement is making a difference over the past year—from a school in Colorado to a health post in rural Ethiopia. Our foundation is supporting these efforts. But we and others need to do more. As budgets tighten for governments and foundations world-wide, we all need to take the lesson of the steam engine to heart and adapt it to solving the world’s biggest problems. One of the greatest successes in terms of using measurement to drive global change has been an agreement signed in 2000 by the United Nations. The Millennium Development Goals, supported by 189 nations, set 2015 as a deadline for making specific percentage improvements across a set of crucial areas—such as health, education and basic income. Many people assumed the pact would be filed away and forgotten like so many U.N. and government pronouncements. The decades before had brought many well-meaning declarations to combat problems from nutrition to human rights, but most lacked a road map for measuring progress. However, the Millennium goals were backed by a broad consensus, were clear and concrete, and brought focus to the highest priorities. When Ethiopia signed on to the Millennium goals in 2000, the country put hard numbers to its ambition to bring primary health care to all of its citizens. The concrete goal of reducing child mortality by two-thirds created a clear target by which to measure success or failure. Ethiopia’s commitment attracted a surge of donor money toward improving the country’s primary health-care services. Last March, I visited the Germana Gale Health Post in the Dalocha region of Ethiopia, where I saw charts of immunizations, malaria cases and other data plastered to its walls. This information goes into a system—part paper-based and part computerized—that helps government officials see where things are working and to take action in places where they aren’t. In recent years, data from the field have helped the government respond more quickly to outbreaks of malaria and measles. Perhaps even more important, the government previously didn’t have any official record of a child’s birth or death in rural Ethiopia. It now tracks those metrics closely. The health workers provide most services at the posts, though they also visit the homes of pregnant women and sick people. They ensure that each home has access to a bed net to protect the family from malaria, a pit toilet, first-aid training and other basic health and safety practices. All these interventions are quite simple, yet they’ve dramatically improved the lives of people in this country. Consider the story of one young mother in Dalocha. Sebsebila Nassir was born in 1990, when about 20% of all children in Ethiopia did not survive to see their fifth birthdays. Two of Sebsebila’s six siblings died as infants. But when a health post opened its doors in Dalocha, life started to change. Last year when Sebsebila became pregnant, she received regular checkups. On Nov. 28, Sebsebila traveled to a health center where a midwife was at her bedside during her seven-hour labor. Shortly after her daughter was born, a health worker gave the baby vaccines against polio and tuberculosis. According to Ethiopian custom, parents wait to name a baby because children often die in the first weeks of life. When Sebsebila’s first daughter was born three years ago, she followed tradition and waited a month to bestow a name. This time, with more confidence in her new baby’s chances of survival, Sebsebila put “Amira”—”princess” in Arabic—in the blank at the top of her daughter’s immunization card on the day she was born. Sebsebila isn’t alone: Many parents in Ethiopia now have the confidence to do the same. Ethiopia has lowered child mortality more than 60% since 1990, putting the country on track to achieve the Millennium goal of lowering child mortality two-thirds by 2015, compared with 1990. 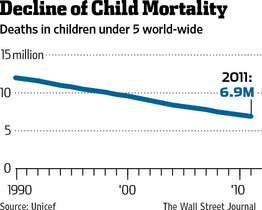 Though the world won’t quite meet the goal, we’ve still made great progress: The number of children under 5 years old who die world-wide fell to 6.9 million in 2011, down from 12 million in 1990 (despite a growing global population). Another story of success driven by better measurement is polio. Starting in 1988, global health organizations (along with many countries) established a goal of eradicating polio, which focused political will and opened purse strings to pay for large-scale immunization campaigns. By 2000, the virus had nearly been wiped out; there are now fewer than 1,000 cases world-wide. But getting rid of the very last cases is the hardest part. In order to stop the spread of infections, health workers have to vaccinate nearly all children under the age of 5 multiple times a year in polio-affected countries. There are now just three countries that have not eliminated polio: Nigeria, Pakistan and Afghanistan. I visited northern Nigeria four years ago to try to understand why eradication is so difficult there. I saw that routine public health services were failing: Fewer than half the kids were getting vaccines regularly. One huge problem was that many small settlements in the region were missing from vaccinators’ hand-drawn maps and lists documenting the locations of villages and numbers of children. To fix this, the polio workers walked through all high-risk areas in the northern part of the country, which enabled them to add 3,000 previously overlooked communities to the immunization campaigns. The program is also using high-resolution satellite images to create even more detailed maps. As a result, managers can now allocate vaccinators efficiently. What’s more, the program is piloting the use of phones equipped with a GPS application for the vaccinators. Tracks are downloaded from the phone at the end of the day so managers can see the route the vaccinators followed and compare it to the route they were assigned. This helps ensure that areas that were missed can be revisited. I believe these kinds of measurement systems will help us to finish the job of polio eradication within the next six years. And those systems can be used to help expand routine vaccination and other health activities, which means the legacy of polio eradication will live beyond the disease itself. Another place where measurement is starting to lead to vast improvements is in education. In October, Melinda and I sat among two dozen 12th-graders at Eagle Valley High School near Vail, Colo. Mary Ann Stavney, a language-arts teacher, was leading a lesson on how to write narrative nonfiction pieces. She engaged her students, walking among them and eliciting great participation. We could see why Mary Ann is a master teacher, a distinction given to the school’s best teachers and an important component of a teacher-evaluation system in Eagle County. Ms. Stavney’s work as a master teacher is informed by a three-year project our foundation funded to better understand how to build an evaluation and feedback system for educators. Drawing input from 3,000 classroom teachers, the project highlighted several measures that schools should use to assess teacher performance, including test data, student surveys and assessments by trained evaluators. Over the course of a school year, each of Eagle County’s 470 teachers is evaluated three times and is observed in class at least nine times by master teachers, their principal and peers called mentor teachers. The Eagle County evaluations are used to give a teacher not only a score but also specific feedback on areas to improve and ways to build on their strengths. In addition to one-on-one coaching, mentors and masters lead weekly group meetings in which teachers collaborate to spread their skills. Teachers are eligible for annual salary increases and bonuses based on the classroom observations and student achievement. The program faces challenges from tightening budgets, but Eagle County so far has been able to keep its evaluation and support system intact—likely one reason why student test scores have improved in Eagle County over the past five years. I think the most critical change we can make in U.S. K–12 education, with America lagging countries in Asia and Northern Europe when it comes to turning out top students, is to create teacher-feedback systems that are properly funded, high quality and trusted by teachers. And there are plenty of other areas where our ability to measure can improve people’s lives in powerful ways—areas where we are falling short, unnecessarily. In poor countries, we still need better ways to measure the effectiveness of the many government workers providing health services. They are the crucial link bringing tools such as vaccines and education to the people who need them most. How well trained are they? Are they showing up to work? How can measurement enable them to perform their jobs better? In the U.S., we should be measuring the value being added by colleges. Currently, college rankings are focused on inputs—the scores and quality of students entering college—and on judgments and prejudices about a school’s “reputation.” Students would be better served by measures of which colleges were best preparing their graduates for the job market. They then could know where they would get the most for their tuition money. In agriculture, creating a global productivity target would help countries focus on a key but neglected area: the efficiency and output of hundreds of millions of small farmers who live in poverty. It would go a long way toward reducing poverty if we had public scorecards showing how developing-country governments, donors and others are helping those farmers. And if I could wave a wand, I’d love to have a way to measure how exposure to risks like disease, infection, malnutrition and problem pregnancies impact children’s potential—their ability to learn and contribute to society. Measuring that could help us quantify the broader impact of those risks and help us tackle them. The lives of the poorest have improved more rapidly in the past 15 years than ever before. And I am optimistic that we will do even better in the next 15 years. The process I have described—setting clear goals, choosing an approach, measuring results, and then using those measurements to continually refine our approach—helps us to deliver tools and services to everybody who will benefit, be they students in the U.S. or mothers in Africa. Following the path of the steam engine long ago, thanks to measurement, progress isn’t “doomed to be rare and erratic.” We can, in fact, make it commonplace. This entry was posted on 1 de Fevereiro de 2013 at 12:50 PM and is filed under Sociedade. You can follow any responses to this entry through the RSS 2.0 feed. You can leave a response, or trackback from your own site.